Asteroid Lamp for Innermost , London & Hong Kong. Asteroid Lamp takes the same basic idea of the astéroide vase (2004). It is made of blown glass, in clear or acid etched versions and in plastic outdoor version. It was firstly presented at the 100% Design Show in London, September 2005. 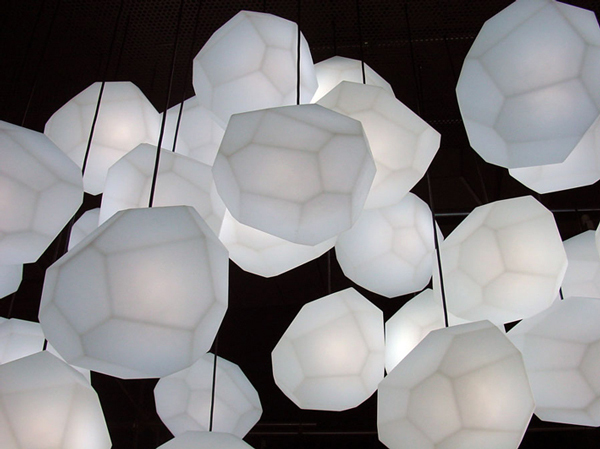 Installation with clear glass Asteroid Lamps at Boutique Noir Printemps Haussmann. The Chinese singer Gigi Leung’s concert series in Hong Kong in December 2007.